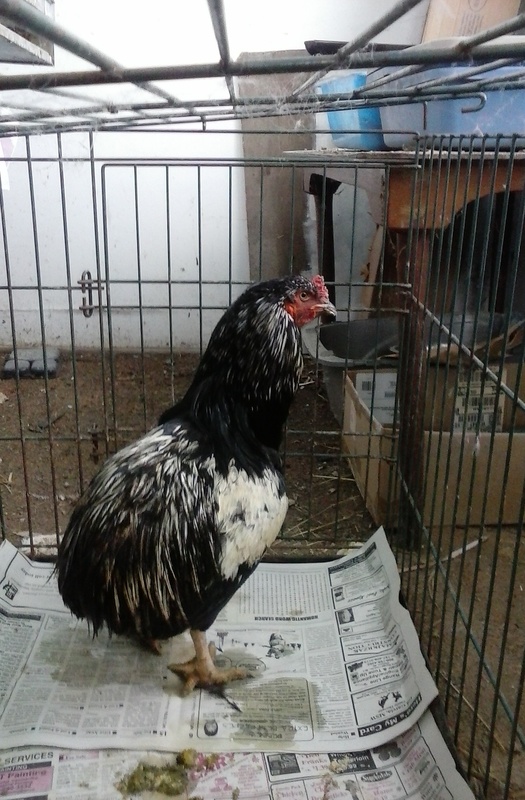 Recently I went out to the barn and found that #221, my sole Araucana rooster, was unwell. At first I thought he had frostbitten feet due to a thawing day followed by a below-zero night. But I put him in to a cage in my kitchen to warm him up and it seems the feet were not the problem. It seems that Rooster 221 was the victim of chicken-on-chicken violence. The other 2 roosters in the barn are the probable culprits. Both are Brahma roosters, which means they are not big on fighting compared to chickens of most breeds. 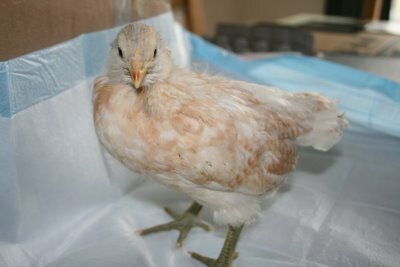 In fact, it’s wise to raise Brahma chicks in a different brooder than chicks of other breeds. Especially cheap Leghorn male chicks. But my Brahma boys ARE twice the size of #221 and they do think they own all the hens on the farm. I moved #221’s cage into my front porch a day ago. That was to expose him to colder temperatures. I’m putting him into an enclosed pen outdoors. I’ll put #221’s wife, #224, with him. I’m also giving him two more hens as mistresses— and a home heating system since 2 chickens don’t generate quite enough heat for an upper Michigan winter. Yesterday I shoveled some snow out of the chosen pen. I also carried a bucket of barnyard manure to put in the pen’s chicken house (a repurposed calf hutch) as bedding. Winter bedding for my penned chickens consists of 2-3 inches of manure to provide warmth, and an inch or two of waste hay on top of that. One advantage of my current housing plan is that I will have a jump on the spring hatching season. Araucana hens lay blue-green eggs. All of my other hens lay brown eggs. So if there is a blue-green egg in the pen it’s a pure Araucana egg and can be put in the incubator. The eggs from the ‘mistresses’ will be brown and will be used as eating eggs. Feisty chickens are part of the chicken raising life. That’s an additional reason why I have pens for groups of chickens. The main reason is that I like raising up my own purebred chicks. In order to have purebred eggs, you have to confine your purebred hens with one or more purebred males. If the hens have been running with assorted breeds of roosters, you have to wait 3 weeks after penning with the purebred roo before you get for-certain purebred eggs you can put in the incubator. It’s funny how easy it is to make a fat person plead guilty to a dietary crime. I sometimes watch this program where a weight-loss surgeon berates morbidly obese people. Somehow all his patients end up accusing themselves of ’emotional eating.’ Now, unless you count hunger as a emotion, or insist that no normal weight people take pleasure in tasty food, or that normal people don’t eat when they have reason to be down or depressed, this doesn’t make all that much sense. But this particular doc seems to encourage a belief in ’emotional eating.’ But he’s willing to perform the surgeries anyway. In older weight loss books the theory was that a fat person was the guy who reached for a extra slice of bread at the dinner table. To understand that, you must know that years ago, people placed a basket of bread at the table for each meal. If you ate your share of the prepared foods and were still hungry, you took a slice of bread. If you were still hungry, you took more bread. I am sure there were plenty of fat people back in that day who WEREN’T filling up on bread at every meal. But it seemed that everyone who bought a weight loss book back then was willing to plead guilty to taking that extra slice of bread. After all, most of them had taken bread at the dinner table at least once. Fat people tend to have low self-esteem because they are told that their extra weight is caused by their own bad behavior. So they admit guilt to whatever it is thin people or doctors accuse them of doing. But the science is not behind all these little pet theories. There is research that would indicate that the real problem that causes weight gain has to do with how an individual person metabolizes carbohydrates. If you have metabolic syndrome or insulin resistance, it’s likely you are overweight or will become overweight. If you remove the root of your problem by adopting a healthy low-carb diet as a lifelong eating plan, you will likely lose weight and feel better without the need of massive doses of ‘willpower’ to help you stick to the diet in spite of hunger— because after the first couple of days on a low-carb diet, you don’t really feel hungry. I think it’s time that we who have weight problems stop pleading guilty to ’emotional eating’ or taking ‘extra’ bread and start realizing we have a physical, biological condition that is not our fault. Read some good books on low-carb/ketogenic diets— I’d recommend the original Atkins diet book, as well as ‘Keto Clarity’ by Jimmie Moore and ‘How I Gave Up My Low-Fat Diet and Lost 40 Pounds’ by Dana Carpender. Because berating ourselves doesn’t cure anything. Knowledge, however, when properly applied, does. Perhaps you do not know that many old-fashioned breeds of livestock are threatened with extinction. One breed, the Chantecler chicken, developed in Canada (by monks), has already been declared extinct. I feel bad about that. So I just ordered a batch of baby Chantecler chicks. How can that happen if the breed is extinct? Well, turns out they were not as extinct as people thought. A few survived in small flocks and the breed was able to continue. Chicks of the breed have been available from Ideal hatchery in 4 color variations, and White Chanteclers are now available from Cackle Hatchery. Why do I want Chantecler chickens? Well, most of my laying hens are getting old, and of the chicks I tried to raise last year I have ONE pullet left. I had Buff Brahmas and Araucanas, but my Araucana rooster has frostbitten feet this morning and probably won’t survive, and the one Araucana hen doesn’t lay eggs very often. The Buff Brahmas are pretty, but don’t lay that well either. So I decided to go for something different this year. My mother has a number of wonderful casserole recipes that she used to cook for the family regularly. (Now that she’s almost ninety, she only makes casseroles once in a great while.) My particular favorite was the tuna casserole. But since it calls for 1 1/2 to 2 cups of shell macaroni, it is not exactly a fit for my low-carb lifestyle. I’ve tried some substitutes for the noodles. None were good except of Dreamfields, which is a good noodle but not really that low in carbs. So I’ve been making my tuna casserole with bean sprouts subbing for noodles. The first thing I have to figure out is the amounts. The original recipe called for 2 cups of noodles. But noodles expand when you cook them, while bean sprouts shrink a bit. I made a batch with 2 cups of fresh bean sprouts and it looked like half a batch. So I think I need to use 3-4 cups of fresh sprouts. My mother always put some tiny green peas in her tuna casserole. But I didn’t have any, and the way the fresh mung bean sprouts smelled when they were cooking made me think I had vegetables enough in the dish with the bean sprouts. I have purchased some peas for sprouting, and when they arrive I may put some pea sprouts into a future batch. You can buy canned bean sprouts at some grocery stores. But I think it’s better to sprout your own at home. I use the Victorio brand sprouters for my salad sprouts (alfalfa, clover, broccoli & radish seed), and that’s how I made my first batch of mung bean sprouts. I put 1 and 1/2 T (tablespoons) of mung bean seed in a small jar to soak overnight— three jars, actually, one for each sprout tray I was going to ‘plant’ with mung beans. Each of the sprout trays in the Victorio brand sprouter holds about 2 cups and is 6 inches in diameter. The sprout trays are sold 4 to a set, but you can stack them up to 10 high. I pour off each jar’s contents into a sprouting tray and let the water drain off. The fact that you stack the trays means that each tray stays moist during the day— even if you skip a watering. I left my sprouts for 2 days over Christmas and they all thrived. You rinse your sprouts at least 2 times a day. The newer model Victorio has a green topper with drain holes (like the sprouting trays do) and so all you have to do is fill the green topper pretty full with water and it will drain down your full stack and water every level. IMPORTANT: before you water your sprouts, check the bottom water-catching tray. It may still have water from the last time you watered sprouts! So dump the old water before you add new water to the topper. The used water has enzymes so you can use it in soup broth or put it in a water dish for your pets or chickens. For the first day or two, check often to see that the newly ‘planted’ sprouts are getting fully watered. Sometimes the sprouts in the center get a little dry. A method I’ve seen recommended is to measure your water, making sure it is under 2 cups, and then give each sprout tray a little water individually, making sure each level gets a good watering. 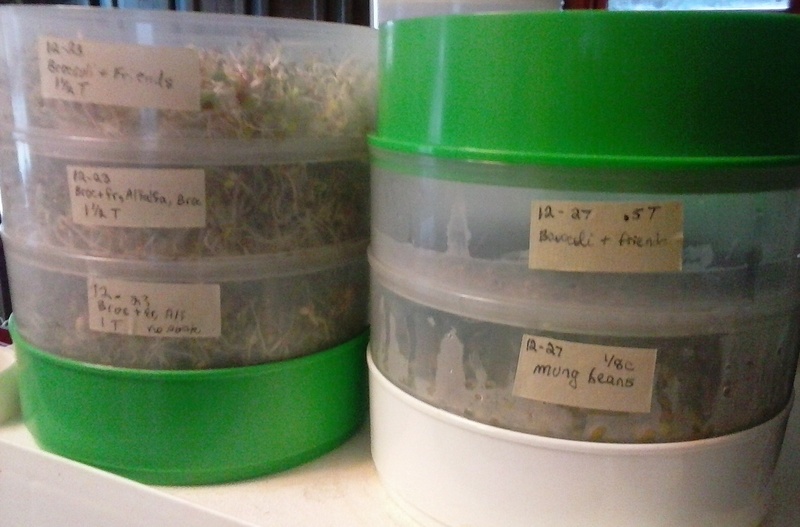 Bean sprouts, like pea and lentil sprouts, are ready in 4-5 days. I wash the bean sprouts in a bowl of lukewarm water to get the green seed hulls off. The green hulls are edible and full of fiber, but most folks like the taste better with most of the hulls off. TO COOK: I put a suitable-sized kettle on the burner with water and perhaps sea salt. Bring the water to a boil before adding your sprouts, and cook for 10 minutes. You can also steam them if you have the right equipment. The resulting cooked sprouts can substitute for noodles or rice in a casserole. Sea salt, pepper and perhaps onion powder to taste, also 1/8 teaspoon of kelp or dulse powder/flakes if you like. Mix the ingredients well and place in casserole dish. Preheat oven to 350 degrees. Bake covered for 30 minutes, covered for 5-10 minutes. My mother used to put crushed soda crackers, moistened with milk and dotted with butter. This adds carbs so I don’t do it. I suppose I could use chopped pecans covered in melted butter for a lower-carb topping, but I don’t like to bother. It’s good enough without. Because my sprouting trays are pretty full, I started the new batch of noodle sprouts in a 1 quart canning jar. I used 1/4 cup of seed. Since 1/4 cup is also 3 tablespoons, I measured out 2 T of mung beans and 1 T of lentils. Lentils are great sprouters and even the brown lentils you find in a grocery store will sprout like the dickens! Plus, I once sprouted some lentils I KNEW had been in my cupboards for 10 years and they sprouted well. So adding the lentils to the mix will save some money.